Junichi Tazawa did not disappoint in his 2nd pro start. 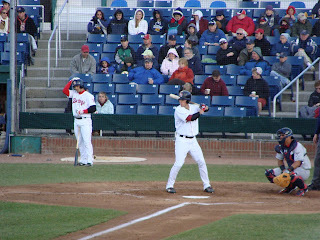 Tazawa and the red-hot Josh Reddick helped the Potland Sea Dogs to a 4 - 3 win over the New Britain Rock Cats Tuesday night at Hadlock Field. Sea Dogs manager Arnie Beyler once again liked what he saw from Tazawa. "I just liked the way he went about things tonight," said Beyeler. "He threw strikes." It was clear Tazawa was using his devastating curve ball as his out-pitch tonight, as Tazawa completely froze Rock Cats 3B Danny Valencia on a called 3rd strike in the 1st, made RF Juan Portes look at his bat in disbelief on a called 3rd strike in the 2nd and left Yancarlos Ortiz standing and staring after home plate umpire Matt Abbott called a 3rd strike looking in the 4th. Tazawa's final line was 6 IP 4H 1ER 2 BB and 3 strikeouts. Tazawa's ERA for his 2 appearances so far is 1.64. As for the offense, Josh Reddick got it going quickly. Reddick launched Rock Cats starter Jeff Manship's 7th pitch of the game for a HR to right-center field for his 4th HR in 4 games. Reddick tied a club record for 4 HRs in 4 consecutive games held by fan favorite Kevin Millar, who accomplished the feat in 1997, but he still wasn't satisfied with his performance. "(I) feel like I need to get more than 1 hit besides that," Reddick said. "I'm trying to see a lot of pitches...worked some pretty good counts and laying off the (pitches) I know I can hit, but try not to get myself out." The Sea Dogs got on the scoreboard again in the 3rd as Reddick worked a walk and Lars Anderson plated him with a nice left center gap shot on a hitters count 3 - 1 pitch. Reddick scored and Anderson took 2nd on the throw home. Aaron Bates sent Anderson home on a RBI single to right. The Sea Dogs finished off their scoring for the night in their half of the 4th when Jon Still singled to open the inning. Still promptly stole 2nd and was driven home when 3rd baseman Jorge Jimenez drove him with a single to left center for his team leading 6th RBI. The Rock Cats did not get on the board until Tazawa gave up a HR to 3rd baseman Danny Valencia to lead off the 6th. Tazawa was not happy with the pitch location. "I left it high," said Tazawa. A pair of Sea Dog relievers, Blake Maxwell and newly promoted Justin Hedrick, kept New Britain off the board until late in the 9th when Hedrick got into a little jam. After striking out Cats RF Juan Portes, Hedrick walked 1st baseman Whitney Robbins. Hedrick followed that by striking out Rene Tosoni, and things got interesting. Hedrick walked Ortiz and followed that with giving up a 2 run triple to Brian Dinkelman. Hendrick shut the door on the rally, getting 2nd baseman Steve Tollison to ground to Jimenez for the game ending play. GAME NOTES - Sea Dogs catcher Mark Wagner threw out Rock Cats LF Matt Moses, making him 5 for 7 throwing out runners this season....The Sea Dogs held a Media Home Run Derby prior to the game. No one hit a HR but Biddeford Journal Tribune Sports Editor Chris Brockman walked away the winner by hitting the warning track on the fly....the Sea Dogs wrap up this home stand tommorrow at 6PM in the finale of the 3 game series.